There’s just some short cuts in life that are too good to miss. 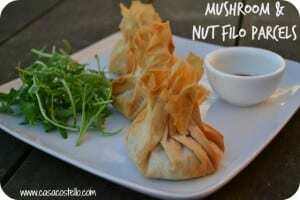 Using bought Filo pastry is definitely one of them. I’d love to say I always make my own pastry but life really is too short when it comes to Filo. The secret to working with Filo (or sometimes known as Phyllo) is to be quick. I only have out of the fridge exactly the amount that I need as it dries out and becomes difficult to work with pretty soon. I have my butter melted ready to spread on each layer and the fillings ready to go. Time is definitely of the essence. I like my parcels to have 3 layers of pastry but you can get away with just 2. I also cover the edges of my pastry with teeny tinned foil lids for the first 20 mins of cooking to stop them catching. Lay one sheet down and quickly brush melted butter around the sides, add another layer on top with the points turned 45 degrees and repeat the butter. Add the final layer and again brush melted butter around the edges. Place one large tablespoon of the mushroom nut mixture in the centres of the squares and quickly scrunch together at the top. The melted butter will help it stick. Allow to cool slightly and serve with balsamic vinegar as a dip and rocket. Enjoy! Disclosure: I was sent vouchers from JusRol to cover the cost of buying the pastry – I was given free choice which pastry to use and the recipe is my own. This looks amazing, definitely one to try out! 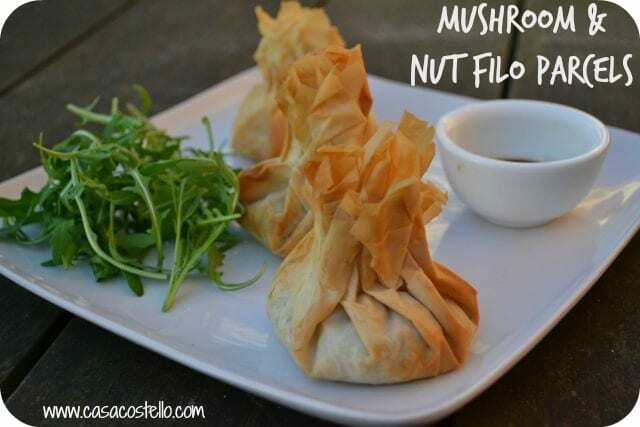 We always use ready-made for filo pastry too – life is just far too short otherwise!